Green Bay Packers coach Vince Lombardi is exuberant as he is carried off the field by his players after the Packers won the NFL Championship in Green Bay, Wisconsin, Jan. 2, 1966. The first 10 games of the NFL season are its exposition period — we get to know the characters and themes that we expect to see develop as the race to the playoffs unfolds.1 This year, like nearly every other in the past decade, the New England Patriots’ refusal to regress to the mean is a central storyline. Remember back when the Patriots were 0-1 and faced a must-win in Week 2? Well, they won. Then in Week 4 they dropped to 2-2, and the end of an era was supposedly nigh. Except no. Pats will be Pats, and now they’ve won their last six games en route to the best record in the AFC. That streak has included comfortable wins against the Cincinnati Bengals (who at one point projected to have the best record), the surprisingly strong Buffalo Bills, and Peyton Manning and Andrew Luck. (The Patriots are also tied with the Green Bay Packers for a league-leading point differential). And according to my colleague Neil Paine, the Patriots are really a second-half team. I shudder to think. But there’s another storyline that’s dominated the exposition period: The best record in the NFL belongs to the 9-1 Arizona Cardinals. While they’ve beaten some decent teams like Dallas, Philadelphia and San Francisco, they don’t have what the yakkers call a “signature” win. They have only the seventh-best SRS2 in football, second to the Packers in the NFC, and only a half-point ahead of the defending champion Seattle Seahawks (who have four losses). Aside from being the class of their respective conferences so far this year, the two franchises have little in common. The Cardinals have now secured their second winning season in a row — and can count that as an accomplishment in light of their 90-year history of losing. Although the Patriots’ dominance of the regular season continues apace, they will likely be disappointed if they don’t win their first Super Bowl in 10 years. The current Patriots dynasty is lengthy and steep, and belongs in the same group as the San Francisco 49ers of the 1980s, the Cleveland Browns of the ’50s and ’60s, or the Chicago Bears of the ’30s and ’40s (especially when you factor in league parity). 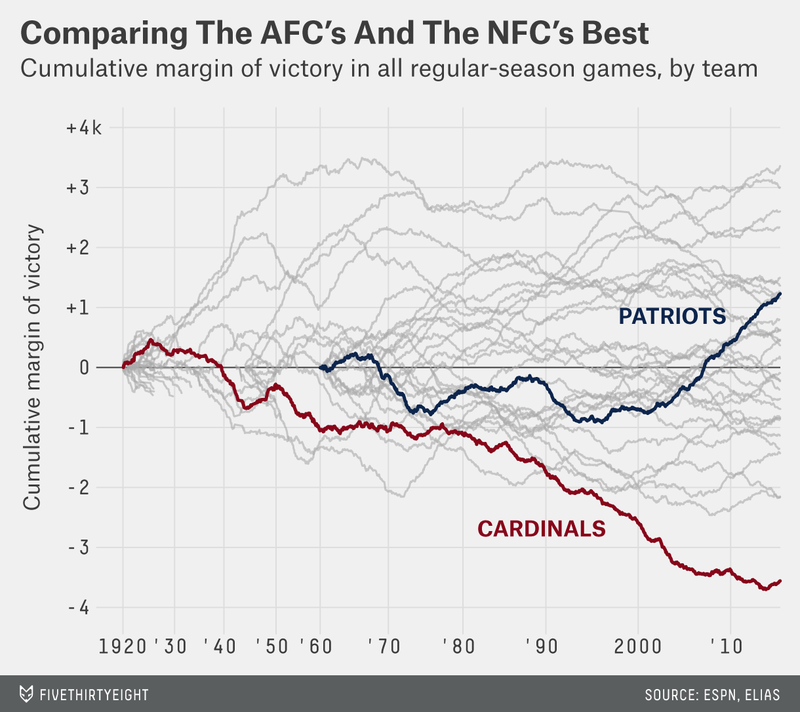 Thanks to the great work of designated Skeptical Football charts guru Reuben Fischer-Baum, you can do just that. Roll over a line to see the team’s entire history, and move along the line to see exactly how many points it has scored compared to its opponents at a given point. You can also click on a team to keep its line highlighted, and then roll over another team for comparison. Irrelevant dates (where no regular-season games were played) are excluded from the timeline. On Sept. 25, 2011, Rodgers threw three touchdown passes as the Green Bay Packers beat the Chicago Bears 27-17. With that result, the Packers had scored 2,991 more points than their opponents all-time, ahead of the Bears’ 2,989 — and the Packers haven’t looked back. 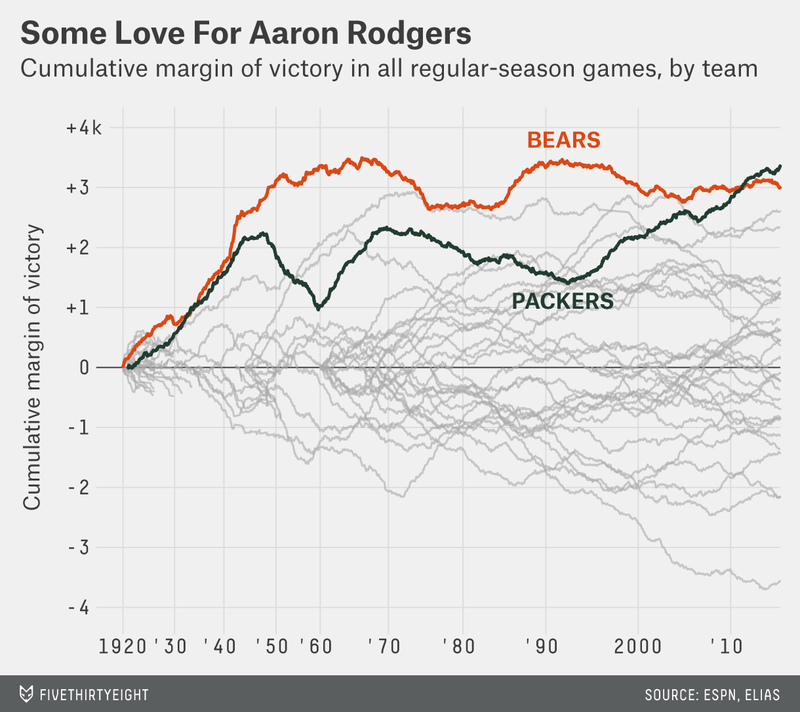 As of last Sunday, Green Bay held the NFL’s best historical margin of victory by 358 points. Last week Neil Paine and I wrote an article titled “Randy Moss May Well Have Been The Greatest Receiver Of All Time” — which focused on the insane “With Or Without You” stats that Moss put up in his career. In the discussion, we raised the possibility that if receivers can have as much of an impact as Randy Moss appeared to have, that may cast doubt on some previous knowledge — like how good of a quarterback Joe Montana was considering he had Jerry Rice running routes for so long. Upon further consideration, I’m inclined to agree that it’s fairly unlikely that Rice was the driving force behind the 49ers’ success. But I’m not so sure Montana was either. Winning in the NFL can happen for a lot of different reasons — a star quarterback (think Peyton Manning), a successful new offensive or defensive strategy (think West Coast offense, zone blitz, or, more recently, the Wildcat), or a standout player who creates mismatches that other teams struggle with (think Randy Moss). But the effects of various win-generating phenomena can come in a lot of shapes and sizes. The “Greatest Show on Turf” Rams had a few different things going for them, but their success was sudden, rocky, and lasted only a few years. They “broke the game” for a while in the sense that they were something the rest of the NFL didn’t know how to deal with. But despite having a lasting effect on how football is played, their dominance was fragile. 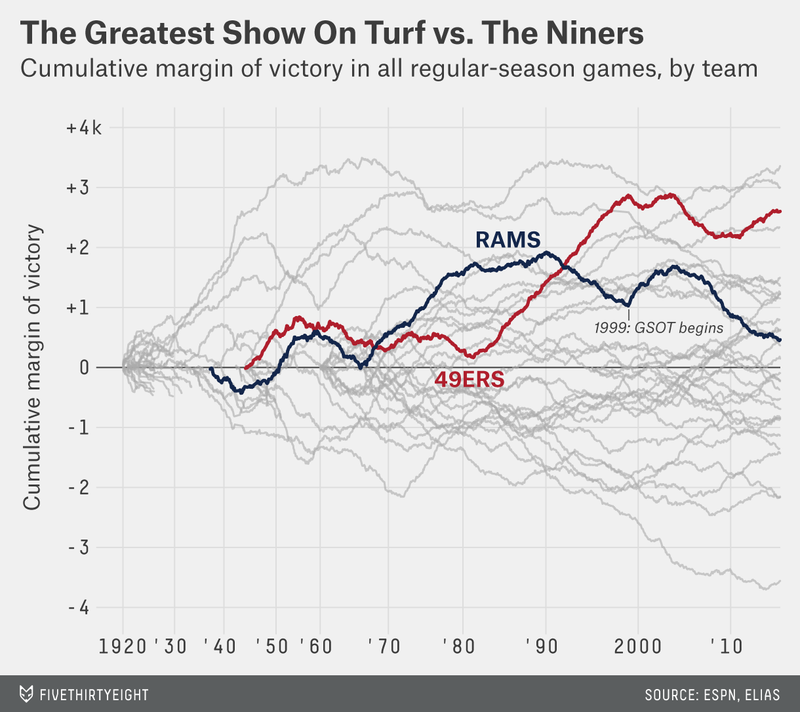 If the 49ers owed a significant part of their success to any one player (or phenomenon of any kind), we’d likely see more variety in the team’s arc as that player’s performance fluctuated, or as he was injured, or left.5 But the consistency of the 49ers’ ascension suggests they were more of an organization-driven phenomenon. At the very least, it implies that they were the sum of many different quality parts. Playing around with the interactive, I’m fascinated by how different phenomena manifest. For example: How do the impacts of offensive and defensive innovation compare? What are the effects of a quarterback versus those of a coach? There are a lot of possibilities, so let us know what you uncover in the comments or on Twitter. I keep thinking (and my editor keeps hoping) this will be the week I won’t bother talking about kickers, but then Las Vegas Locomotives alumnus Graham Gano has to go and attempt a 63-yard field goal with one second left in a thriller between the Carolina Panthers and the Atlanta Falcons. Unfortunately for the Panthers, it was blocked. 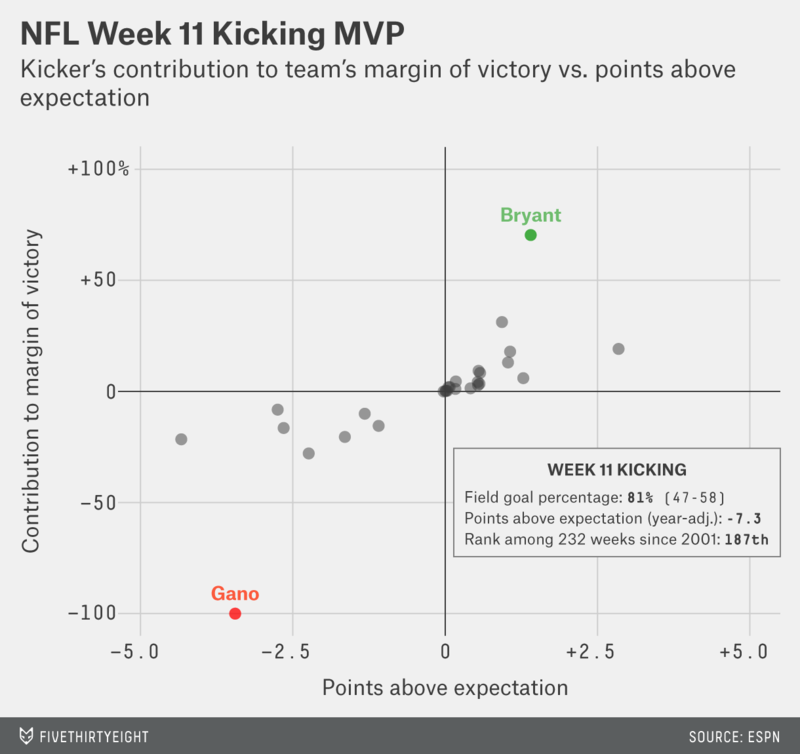 My kicking model suggests that a kicker in 2014 should typically be able to make a 63-yard field goal around 40 percent of the time — but this may be skewed by the fact that such long kicks are so rarely attempted. Still, Gano’s 63-yarder wasn’t what earned him the “kicker loss”6 and Week 11’s Least Valuable Kicker award. What did him in was his previous miss, a 46-yarder, which a 2014 NFL kicker should typically make about 77 percent of the time. My algorithm picked the Falcons’ Matt Bryant as the MVK over the St. Louis Rams’ Greg Zeurlein (who had an excellent week, going 5/5 with two 50+ yarders in the Rams’ huge upset of the Broncos), on account of Bryant making four field goals in a game his team only won by two (though none was over 44 yards). But the biggest news of the week is that with Nick Novak missing a kick for the San Diego Chargers, we’re down to just two perfect kickers, and they’re both veterans: the Indianapolis Colts’ Adam Vinatieri and the New York Giants’ Josh Brown. In general, Eli Manning is a bit of an unknown. He puts up fairly big totals for a mediocre team, but often gets criticized for his high interception rate. Yet his win curve looks mostly like his big brother’s, only flatter, and it’s plausible that his shame-free style was partially responsible for the Giants’ shocking wins in two Super Bowls. Eli’s gambling wouldn’t necessarily make the Giants favorites against stronger competition, but it might have given them a better chance against a team like the 2007 Patriots than a better team with a quarterback who took fewer risks. Just for fun, I looked at the Pro Football Reference list of quarterbacks with the most four-plus-interception games. The top four are George Blanda, Joe Namath, Ken Stabler and Terry Bradshaw (all of whom won championships, and three of whom are in the Hall of Fame). Of the top 50 such QBs, 15 have won championships (and account for 20 Super Bowls), including both brothers Manning. The Jacksonville Jaguars’ Blake Bortles had a bye week. The Oakland Raiders’ Derek Carr, despite finally winning a game Thursday night (in dramatic fashion) has had a pretty weak couple of weeks, with just 172 and 174 yards in Weeks 11 and 12, despite a combined 69 pass attempts. The Minnesota Vikings’ Teddy Bridgewater’s two game winning streak came to an end in Chicago. Manziel once again got all dressed up with no ball to throw. Not really in the game yet but worth keeping an eye on: Logan Thomas is now second on the depth chart in Arizona. So far this year he has a 108.9 NFL Passer Rating, but he’s gotten it the hard way: He has only one completion in eight attempts (10 if you count sacks), but it went for 81 yards and a touchdown. In Week 9’s column, I introduced my experimental “win curves” for quarterbacks, which depict how much each QB typically wins relative to various expectations, and I included a number of examples. Being very far ahead or behind in the first quarter is rare, so you should take the tails of that quadrant with a grain of salt. In the second and fourth quarters, Cutler seems to outperform average in a pretty uniform way, and in the third-quarter he has a bit of a reverse-Matthew Stafford thing going on. The Cardinals’ matchup against the defending champion Seahawks is a pretty big test for the team with the league’s best record. But on top of that, the Cardinals have a lot of important parts coming and going, which is always empirically significant: Their top QB (Carson Palmer) is out. Last week, Cardinals backup Drew Stanton held off the Detroit Lions’ Stafford at the end of the game, but the Cardinals still struggled. Leading for most of the game, they rushed 26 times, but gained only 46 yards. And their top receiver, Larry Fitzgerald, is injured but may play anyway. As demonstrated in the article on Moss, the value of top-notch WRs can affect our broader understanding of the game. And then there are the Seahawks — who were young powerhouses last year, but are possibly already in decline — and Russell Wilson, who last year averaged 33.7 yards rushing per game. That’s by far the most of any QB in a year his team won the Super Bowl — and he’s averaging 57.1 per game this year. 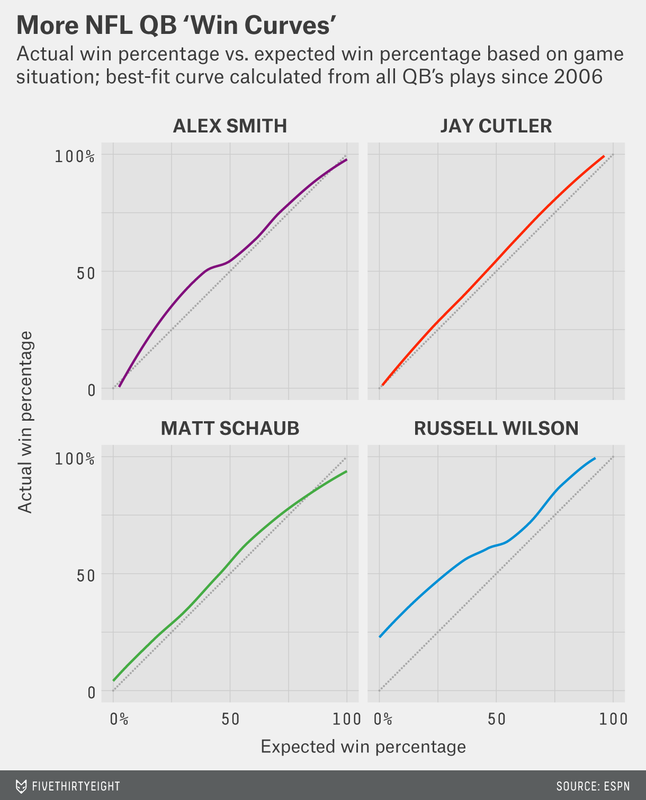 What “running” quarterbacks mean for the game is a fascinating open question. A lot of newer, fancier QB-rating systems are giving QBs a lot of credit for their scrambling (often much more than if you treated those plays the same as completed pass attempts). But while those individual plays can be valuable, there haven’t been a lot of dynamic offenses built around running QBs, and it’s still unclear whether this is just a bonus skill or whether it will be a necessity in the future NFL. It’s perhaps even more valuable to see Wilson in action with the Seahawks struggling a bit (it can also be harder to isolate an individual player’s contributions when a team is firing on all cylinders). He’ll be tested against a Cardinals defense that grades out as one of the best in the NFL this year — a perfect opportunity to see what both are made of. That leaves only two stages left, development and recapitulation — meaning the season is finally one-third over! Simple Rating System, or margin of victory adjusted for strength of schedule. Of course, Rodgers throwing eight touchdowns in the first half over the past two weeks isn’t helping resolve the issue. For any skill level, win-maximization may call for “risky” strategic adjustments in certain scenarios. So while Rodgers keeps looking better and better, the Hacker Gods are remaining silent on his ability to make those adjustments. Maybe you can do better, but I couldn’t find a line that straight for that long. 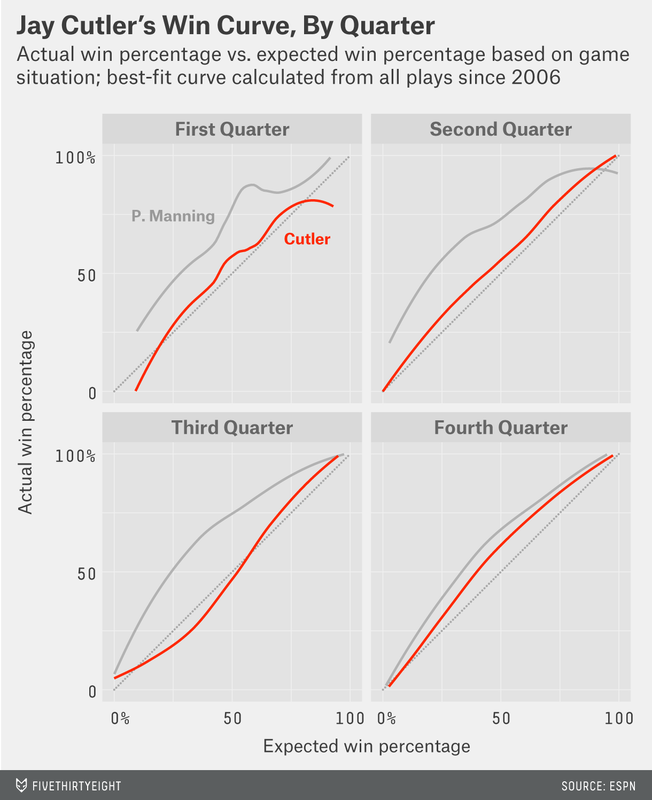 One interesting line for comparison purposes is the Indianapolis Colts, where you can see that Peyton Manning’s arrival shifted their trajectory, but it was still a lot rockier than for a team like the 49ers or the Patriots. Where the margin of victory of a losing team is smaller than the points below expectation its kicker gave up. And the last, coming on fourth down, was actually better for his team than an incomplete pass would have been. For those of you keeping score at home, our Week 10 winner will go down as the New Orleans Saints’ Drew Brees, for his aggressive tack against San Francisco that almost led to a stunning comeback. Yes, future pedantic emailers, this is a deliberate oversimplification. It turns out the issue was a quirk of the smoothing method I was using. The geom_smooth() function in R was using a GAM model, which “fits” what order of polynomial to use as well as what values to use for each argument. In Cutler’s case, the curve was flat enough that it was choosing to use a linear function.) So to get more contour, I tried using a different method (forcing the smooth to use a local regression — or “loess” in R.